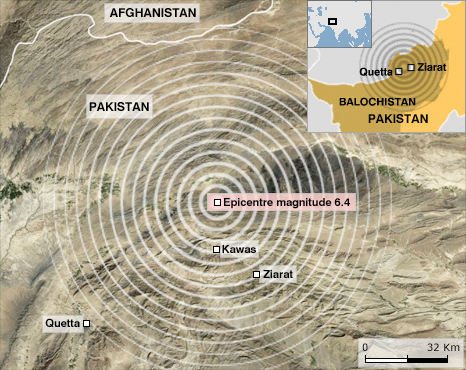 On Wednesday, a 6.4-magnitude earthquake struck Pakistan’s Balochistan province, killing at least 170 people and leaving thousands homeless, [see related CHUP post]. When I first heard news of the tragedy, the first thought that came to me was an image I captured in a photograph almost three years ago, [see above], when I visited Balakot. The town, located in the NWFP, had been completely destroyed by the October 2005 earthquake, a disaster that killed about 74,500 people and injured over 100,000 in the region. It was one the largest natural disasters to afflict Pakistan, and was labeled the 14th deadliest earthquake of all time. Upon arriving in Balakot, we stopped to survey the devastation from a hilltop. The haunting image I captured above immortalized the emotions we were experiencing at that very moment – feelings of helplessness and concern, sadness and despair. The most overpowering emotion, though, was how small we felt amid the vast stretch of destruction and rubble that lay before us. It seems that no matter how much destruction we can cause by our own hands, through suicide bombings, violence, and intolerance, the power of God and nature will always bring us to our knees. 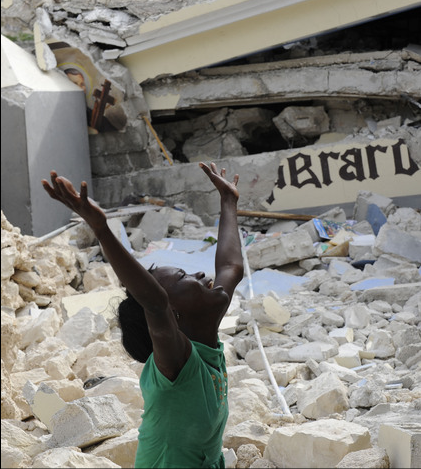 If the earthquake in 2005 taught us anything, it’s that with immense tragedy comes the outpouring of human compassion. I still remember in 2005, when residents in Islamabad pitched in to help lift bricks and rubble in F-10, to help recover survivors from a collapsed apartment building. I remember how many people donated blankets, warm clothes, and tents to those suffering in the afflicted areas near Kashmir. Let us showcase that same compassion in the aftermath of this tragedy. We cannot stop the occurrence of natural disasters, but we can help restore what was left in their wake. Islamic Relief is now accepting donations for relief efforts on their website, [thanks, Five Rupees]. UPDATE [10/30 1100 EST]: Pakistani soldiers handed out tents, blankets, and sleeping bags to earthquake survivors on Thursday, as news agencies reported the death toll rose to 215. Media outlets report that this is the deadliest earthquake since the massive earthquake that hit the Kashmir region in 2005. CHUP will continue to provide updates as they occur.